We became aware of london based artist, World War Won's street work a few weeks ago when we stumbled across some works that he had installed on a number of the outdoor cigarette ashtray bins that are to be found on the walls outside most bars and restaurants in London. You can see the pictures of that street work in the blog post we posted last week here. 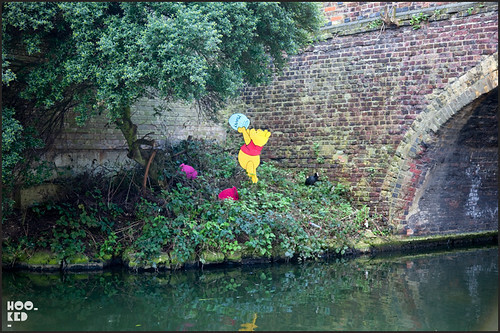 For their latest project 'WWWINNIE THE POOH - MUNNY' the artist has hit up the current streetart hotspot up near Broadway Market in East London using a boat or some floatation device to cross the canal and install this wonderfully placed Winnie the Pooh cutout. Take a look at the World War Won website as they have some other interesting project they have placed around London. This is the art work of A. 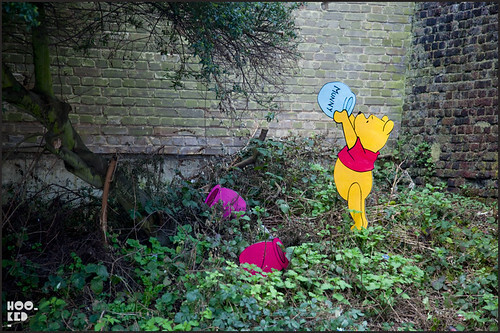 A. Milne and E. H. Shepard, that someone is placing out on the streets for viewing. The streets are this person's gallery. When a gallery decides to show an artist's work, that creativity does not become their art idea or conception. didn't Banksy make a stencil of this exact same idea some years ago?